This topic describes the prerequisites and the procedure for enabling Session Replay. Session Replay data must be stored in a different volume, known as the secondary disk; therefore, every node in the cluster must have such a volume allocated to it. Mount the directory outside the PurePath directory. PurePath and Session Replay folders must not be nested, but parallel. For example, if the pure_path directory resides at /mnt/dynatrace/pure_path, the session_replay directory can reside at /mnt/dynatrace/session_replay. Assign the ownership of the directory to the dynatrace:dynatrace user. Launch the in-place upgrade sequentially on every node with your launch-installer.sh file. The path of this file is dependent on environment. An example upgrade command is: [Path]/dynatrace/install/dynatrace-managed/installer/launch-installer.sh –upgrade Managed will be reconfigured and restarted. Upon restart, the new Session Replay storage location will be used. Click the Browse [...] menu button and select Edit. From the Application settings menu, select Session Replay. 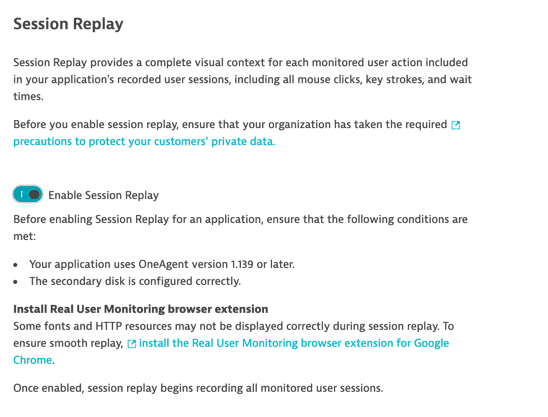 Note: If the Session Replay option is missing from your Application settings menu, refresh your browser window. If the option is still missing, use the chat icon within the portal to contact a Dynatrace ONE Product Specialist. Turn the Enable Session Replay button on. Learn how to configure Session Replay. Note: No additional configuration is required to set up agent-less monitoring.